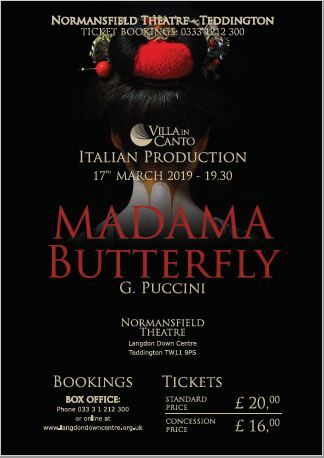 Villa Incanto returns to Normansfield Theatre with their alternative to traditional stages operas bringing their version of Madama Butterfly, by Puccini. This is a tender and moving tragedy of the ill-fated Japanese geisha. Madama Butterfly is an all-time favourite with audiences and will be performed by a cast of singers who have sung across Europe. Villa inCanto aims to maintain the integrity and the grandeur of original plts by filling the opera with emotional energy. A review by Ian Nethersell of Villa InCanto’s last production enthused about the performers and the production “the paring down, without compromise to quality and congruence drew me into the piece and I left feeling as though I had been part of it, experienced it and not just watched it”.